While Microsoft is best known for Windows and associated hardware, it's also a widely renowned peripheral maker, and its latest product aims to control just about everything, including smart TVs and Android tablets. Combining a full-sized QWERTY keyboard with a multi-touch trackpad, the All-in-One Media Keyboard is a peripheral perfect for couch potatoes. With it, users can control smart TVs and set-top boxes by clicking and typing from afar. The device connects via radio frequency signals set to an included USB dongle that users can plug into a their smart TV or media streaming box. The RF dongle works with most devices that have a USB HID compliant port, including the Roku 3 and Apple TV, but nothing too small and stick-like such as the Roku Streaming Stick and Google Chromecast. 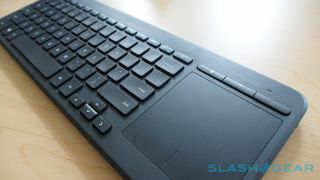 SlashGear got an early hands-on with the keyboard and said that overall, it's a bit mushy. However it has more than a few nice features including a row of media function keys along the top. Along with the usual left and right clickers found underneath the trackpad, there's also an additional left-click on that side of the device for easier navigation. Meanwhile, on the bottom of the keyboard lives a removable battery door hiding two AA batteries and an extra magnetic cubbyhole for stowing the RF receiver. The All-in-One Media Keyboard is compatible with both full and RT versions of Windows 8.1, 8 and 7, along with OS X 10.7 Lion through 10.9 Mavericks. An oddly specific batch of Android - 4.03, 4.12, and 4.2 - are also compatible with the keyboard. It will be available starting tomorrow for US$39 (about AU$41). Now that you have a remote for it, what's the best smart TV money can buy?